If you've seen Amadeus - the award-winning film or the play written by Peter Shaffer - you know it shows how Antonio Salieri , an Italian composer (1750-1825) became so consumed with jealousy of Wolfgang Amadeus Mozart he not only worked to destroy the composer's career, he went on to poison the genius musician, and in the process destroyed himself - literally driving himself crazy with a vicious, malicious resentment of Mozart, then remorse for killing such a magnificent gift-of-God talent. 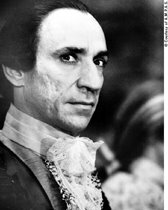 F. Murray Abraham portrayed the troubled Salieri in the film. Salieri suffered his final years in an insane asylum, eaten alive by his hatred of the gifted young composer and himself. Tom Hulce portrayed Mozart in the film. A portrait of the real Mozart. After an unsuccessful suicide attempt, Salieri was forced to live with the demons he created and fomented from his resentment and desire to be born with the talent the "undeserving" Mozart possessed. 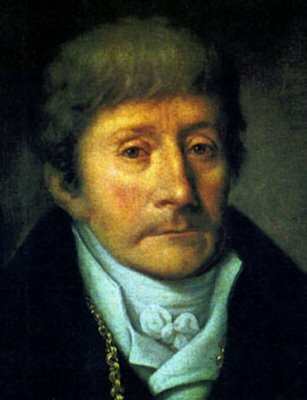 Salieri was no stranger to talented musicians - he taught such luminaries as Ludwig von Beethoven, Franz Schubert and Franz Lizt. But Mozart was different - Salieri saw in Mozart the potential of being the greatest composer to ever live. He resented Mozart even as a young prodigy - a phenom in today's vernacular. Still, compositions created by Mozart as a youngster would not be as great as those he composed as a young adult. 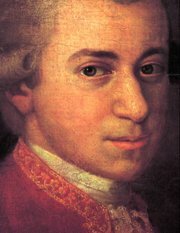 Mozart died when he was 35, his body dumped in a mass paupers' grave. The real story in "Amadeus," of course, is Salieri's. His devious, horrific, senseless rage against the willful young composer. Here is Salieri's portrait; the eyes tell his story, don't they? But, as he knew - without reason - after he was gone, no would show up to watch a story about a guy named ... "Salieri" (who?). Just as he knew - without reason - that Mozart's body would somehow be rescued from a paupers' mass grave; that Mozart's name would somehow rise from the ashes and live on and be one of the world's most revered composers. After seeing the film, I shook my head. "What a waste." Because Salieri did not recognize his own great talent, he led a life of anger, hatred, bitterness and loss. To me, Salieri's true gift - his real genius - was identifying magnificent talent. Talent others did not have the ability to perceive, recognize, appreciate or comprehend. He saw a magnificence others did not. He recognized Mozart's phenomenal prodigiousness; his enduring brilliance. While many appreciated Mozart's talent, none found it to be the degree Salieri discerned. Imagine how enjoyable Salieri's life would have been had he not only befriended Mozart, but did everything he could to enhance his work; to elevate Mozart's genius, his career, his life and his future. They could have had a "bromance!" Jealousy is the desire to have something we can never possess. It's a forever unrequited craving that can never be realized. Never. It's a self-made tragedy that too often harms the target of that jealousy - especially the target of that unnecessary bitterness. It's sad to witness that self-created devastation. I saw Amadeus at a time I worked with people whose talent I discovered and fostered. I had never considered discovering and nurturing potential and talent as a true gift unto itself. After seeing Amadeus, I realized that I revel in finding great talent and assisting those who are born with it - I don't get jealous. I only want to help them, nurturing their talent to it's greatest expression. It's exciting and so much fun to be around it - to bask in its glow! I also work professionally in the realms I coach and mentor. I hope Shaw misspoke when he declared, "Those who can, do. Those who cannot, teach." I like to think I am capable of doing both, and believe that teaching is a specific and special skill unto itself. As I'm sure others who also nurture/teach/mentor will agree: it's a very rewarding life. As for me, I give totally, purely and selfishly out of love. I love the process and the people - the discovery, the nurturing, the discipline; witnessing their growth, confidence and excellence. It's every bit as exciting for me to share in the other person's experience as it is for the person with whom I'm working. Hope you're less sad now. New information - thanks and I also found out that recently scientists discounted the notion that Salieri poisoned Mozart (even though apparently Salieri thought he had). Long stories are fun to write. Well, I'm glad you posted! It was only a few days after I wrote this blog, based on the play/film's content of course, that I read the new facts of the case that have been uncovered, some of them very recently, others awhile back. Good that blog readers tend to read the comments even more carefully than the post itself!